With a week of Portland's cool Fall rain behind me, my mind is starting to turn a little towards Holiday time. In particular, Holiday dinners, though this recipe is great any time. 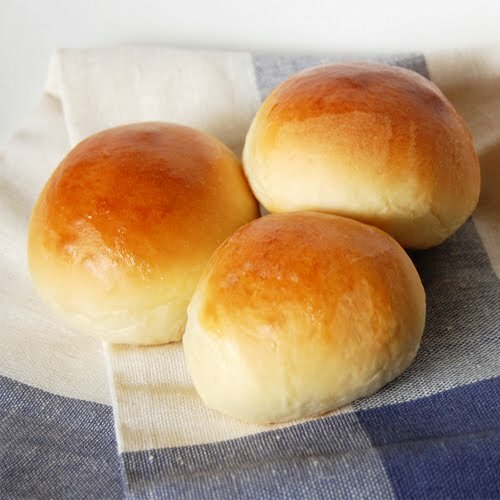 What dinner at any time of year couldn't be improved with some delicious dinner rolls? 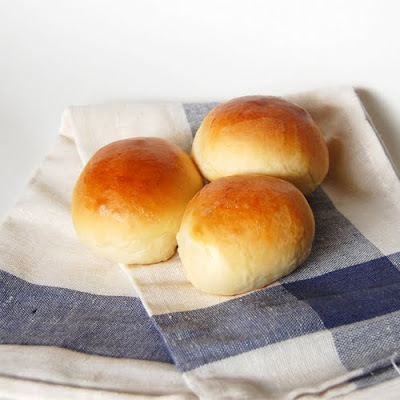 This recipe yields 16-18 small dinner rolls, but if you are cooking for a crowd I would recommend doubling it, who can resist seconds or thirds? Start by warming your milk. This can be done in a microwave or in a small saucepan on your stove top. It should be around 108-110 degrees, too hot and it will kill your yeast (not a yummy thing). Put your milk, yeast, sugar and salt in a bowl (or stand mixer) and mix it together a little bit, let stand for about 5 minutes. Next, add in your butter and egg, plus one cup of your flour. Mix this together until your egg and any butter lumps are worked into the dough (sometimes I just melt all of my butter to avoid the lumps altogether). Then add in the rest of your flour and mix until it has come together. Remove onto a floured surface and knead by hand for a couple minutes, if your dough is too sticky you can add a bit more flour (with all the rain we get here I often have to add up to an extra 1/2 cup). Don't add too much extra, this dough is a pretty soft dough, you just don't want it to be a sticky glob. Place dough into a greased bowl and cover with a tea towel and allow to rise for an hour, or until it has doubled in size. Punch down, and allow to rise an extra 30-45 minutes (until doubled in size again). Preheat oven to 425 degrees. Form your dough into balls and place on a parchment lined baking sheet (you could also just grease the bottom of your pan, but I like keeping my pans clean and ensuring easy removal). Allow formed rolls to rise an additional 15 minutes or so before baking. You may brush the top with an egg wash if you like. Bake 12-14 minutes until tops are golden brown and delicious! I generally brush the tops of mine with a little butter when they come out of the oven as well. Allow to cool slightly before serving (I almost always burn myself a little tasting one as I simply can't wait, don't be like me). Thanks! They really are easy, but so yummy! Yeast and me aren't best friends but this must be tried! They look so perfect! I never used to do a lot of baking with yeast. I'm pretty sure I always used water too hot and killed mine. I have a nice little digital thermometer I picked up for about 10 bucks at Sur La Table, it has made a lot of difference. Also, I generally do a lot of baking all on the same day, so that way my kitchen is pretty warm while my bread is rising, and it's the last thing I stick in the oven. A cold room will really hinder your results with yeast. She made then again tonight and I can't keep my hands off of them! By far the most beautiful and delicious rolls ever. But it makes SO much!! I wish there was a way to cut the recipe down, but that dang egg! You can't use half an egg.... can you..? Or does this dough freeze? Gah! I just can't waste any of the deliciousness! You CAN freeze the dough! I think it lasts a few months, but really, who is going to leave it in there that long? I know I never have. Found this on Pinterest. These rolls are great !! !